Join us in recognizing Chicago’s American Graduate Champions! In Chicago, local host Brandis Friedman, correspondent for WTTW’s Chicago Tonight, shares stories of local organizations and individual champions working to create positive outcomes for youth and families. If these stories inspire you to get involved, take one of the Seven Simple Steps to become an American Graduate Champion and support students on their path to high school graduation. The Institute for Juvenile Research (IJR) at the University of Illinois at Chicago promotes effective policies and practices to relieve mental health burdens of children and families living in high poverty urban communities. Programs focus on early identification, prevention and intervention of behavioral and emotional difficulties among youth. WTTW has partnered with IJR on the multiplatform campaign, Graduation Starts Now, to emphasize positive parenting activity for young children that will help them achieve future educational success, and put them on a path to high school graduation and beyond. Turning the Page focuses on family engagement to improve children’s educational experiences and their school communities. Through community nights, author visits, summer learning events, parent leadership programs, teacher professional development and book distribution for families to build home libraries. Programs build on each other and empower parents to become confident in their abilities to improve educational outcomes for their children. Turning the Page has a 15 year history in Washington DC and in 2015 expanded their work to the North Lawndale community in Chicago. American Graduate Champion: Marvinetta Penn, Founder of Global Girls Inc.
Champion Marvinetta Penn founded Global Girls Inc. in 2000, a youth performing arts & education organization on the south side of Chicago that provides school and community based programs for over 2,000 youth. Penn was a Chicago Public School English and Theater teacher for 20 years. She wanted to combine her passion for the arts with girl empowerment and started Global Girls Inc. to provide a safe space where girls, ages 6-18 could learn performance, communication and social/emotional skills. Be an American Graduate Champion! Champion Sally Hazelgrove started volunteering with at risk youth in the Englewood neighborhood of Chicago more than 15 years ago. Englewood consistently ranks as one of the most dangerous neighborhoods in the city and Sally saw firsthand how easily gangs were able to attract young men that were disenfranchised from society and lacking purpose. To give youth an alternative to gangs, Sally started the Crushers Club to provide them with skills and outlets to improve their lives, rebuild their community and keep them on track to graduate high school and future success. 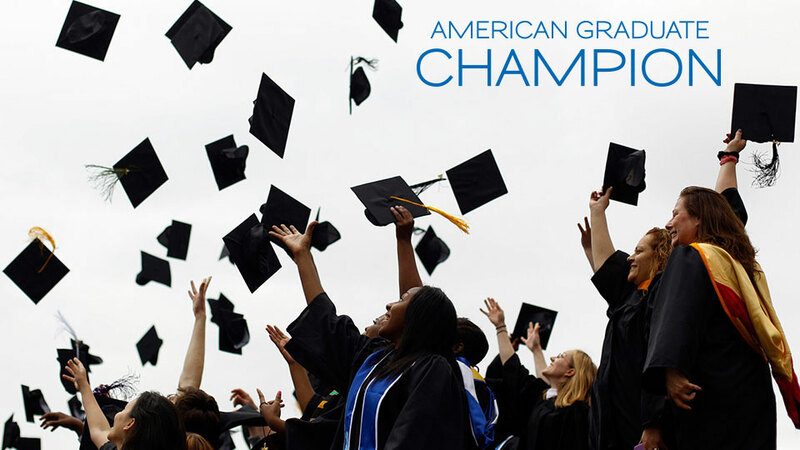 Become an American Graduate Champion! Chicago Public Schools has partnered with the University of Chicago Urban Education Institute and the Lefkofsky Family Foundation to create The Success Project, focused on students’ middle school years to prepare them for success in high school and college. Beginning in the 6th grade, The Success Project works to provide students with better academic preparation, social support and help in identifying the “right fit” for schools to put more young people on the path to graduation and future success. This story originally aired on Chicago Tonight on January 28, 2015. WTTW asked youth across Chicago to share their thoughts on what makes a great teacher. Do you know a great teacher? Recognize them as an American Graduate Champion! Share their story and join the conversation on social media using the hashtag #AmGradChicago. Perspectives Charter School and "I Am For Peace"
Perspectives operates five open-enrollment public schools serving 2,300 students, grades 6-12, in Chicago. 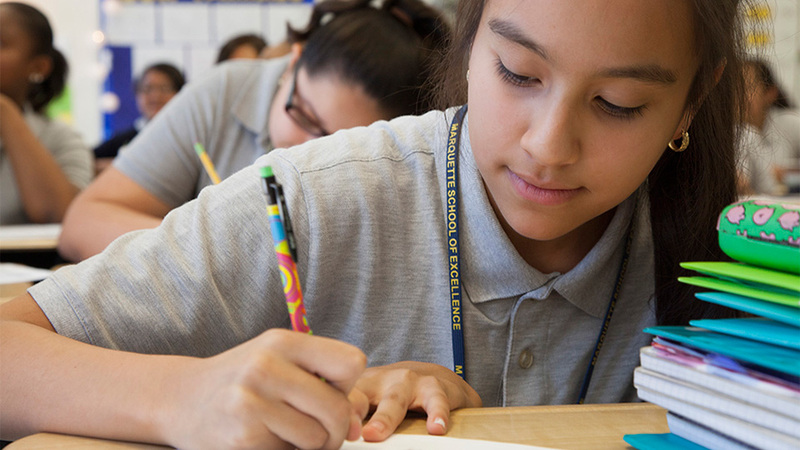 Through their unique curriculum, A Disciplined Life, Perspectives drives academic performance and builds character in students from some of Chicago’s toughest communities. Students at Perspectives started the “I Am For Peace” movement and organized a peach march to raise awareness of the effects of violence in their lives and paths to educational success. Students continue to share how the principles of A Disciplined Life can help create a more peaceful Chicago. A documentary film, “I Am For Peace” was produced, highlighting the work of students to disrupt the escalating violence in Chicago’s neighborhoods. Gigi’s Playhouse provides educational and therapeutic programs at no charge to families and serves children and adults of all ages with Down syndrome. With 24 Playhouses across the country, more than 25,000 individuals benefit from programs that encourage achievement, belief and confidence. Champion Emile Cambry created Blue 1647, an entrepreneurship and technology innovation center focused on a community-based approach to workforce development in the digital age. Programs at Blue 1647 are designed to encourage students in low-income and minority communities to explore careers in technology and build 21st century skills. Blue 1647 provides a creative and comfortable environment for students to learn coding, 3D printing, mobile and web application development and more. By making technology accessible, Cambry believes that Blue 1647 is transformative for many students, providing an alternative to violence and re-engaging those that are at risk of dropping out of high school. Be an American Graduate Champion! Chicago Public Schools has created the Early College Initiative, allowing thousands of high school students to earn college credits at more than 30 schools across the city. Early College STEAM schools use technology, training and partnerships with neighborhood schools to prepare students for the technology jobs of the future. This story originally aired on Chicago Tonight on July 2, 2015. The Student Outreach and Re-engagement (SOAR) centers help Chicago Public School students who have dropped out of high school earn their diplomas. The centers provide motivation and training to prepare students for a successful return to the classroom. Part one of this story originally aired on Chicago Tonight on October 7, 2014. CPS Options Schools provide students, whose life choices or system failures have put them at risk of dropping out, with opportunities to pursue new pathways towards high school graduation. These schools brings thousands of students back to the classroom and offer additional support such as child care, counseling and alternative schedules. Part two of this story originally aired on Chicago Tonight on October 8, 2014. The need for affordable post-secondary education has become so urgent that, although historically, community colleges have had low graduation and transfer rate, there is a renewed focus on two-year colleges and what they need to do to be successful. Chicago is already offering free community college tuition to local students and now Loyola University has created Arrupe, its own two-year college that just opened for the 2015-2016 academic year. President Barack Obama has proposed a similar nationwide plan, inspired by the Chicago Star Scholarship, right here in Chicago. This story originally aired on Chicago Tonight on April 30, 2015.